We have referred to NuclearSafetySim and the use of simulation tools on a regular basis in this blog. NuclearSafetySim is our initiative to develop a new approach to safety management training for nuclear professionals. It utilizes a simulator to provide a realistic nuclear operations environment within which players are challenged by emergent issues - where they must make decisions balancing safety implications and other priorities - over a five year period. Each player earns an overall score and is provided with analyses and data on his/her decision making and performance against goals. It is clearly a different approach to safety culture training, one that attempts to operationalize the values and traits espoused by various industry bodies. In that regard it is exactly what nuclear professionals must do on a day to day basis. At this time we are making NuclearSafetySim available to our readers through a web-based demo version. To get started you need to access the NuclearSafetySim website. Click on the Introduction tab at the top of the Home page. Here you will find a link to a narrated slide show that provides important background on the approach used in the simulation. It runs about 15 minutes. Then click on the Simulation tab. Here you will find another video which is a demo of NuclearSafetySim. While this runs about 45 minutes (apologies) it does provide a comprehensive tutorial on the sim and how to interact with it. We urge you to view it. Finally...at the bottom of the Simulation page is a link to the NuclearSafetySim tool. Clicking on the link brings you directly to the Home screen and you’re ready to play. As you will see on the website and in the sim itself, there are reminders and links to facilitate providing feedback on NuclearSafetySim and/or requesting additional information. This is important to us and we hope our readers will take the time to provide thoughtful input, including constructive criticism. We welcome all comments. 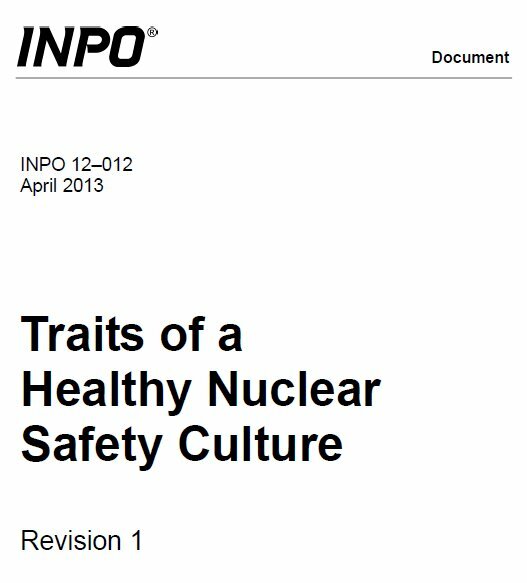 The Institute of Nuclear Power Operations (INPO) has released a document* that aims at aligning their previous descriptions of safety culture (SC) with current NRC SC terminology. The document describes the essential traits and attributes of a healthy** nuclear SC. “[A] trait is defined as a pattern of thinking, feeling, and behaving such that safety is emphasized over competing priorities. . . . The attributes clarify the intent of the traits.” (p. 3) While there is an effort to align with NRC, the document remains consistent with INPO policy, viz., SC is a primary leadership responsibility. Leaders are expected to regularly reinforce SC, measure SC in their organization and communicate what constitutes a healthy SC. There are ten traits organized into three categories. Each trait has multiple attributes and each attribute has representative observable behaviors that are supposed to evidence the attribute's existence, scope and strength. Many of the behaviors stress management's responsibilities. The report has too much detail to summarize in this post so we'll concentrate on one of the key SC artifacts we have repeatedly emphasized on this blog: decision making. Decision making (DM) is one of the ten traits. DM has three attributes: a consistent process, conservative bias and single-point accountability. Risk insights are incorporated as appropriate. 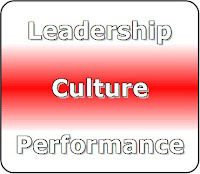 Observable behaviors include: the organization establishes a well-defined DM process; individuals demonstrate an understanding of the DM process; leaders seek inputs from different work groups or organizations; when previous decisions are called into question by new facts, leaders reevaluate these decisions; conservative assumptions are used when determining whether emergent or unscheduled work can be conducted safely; leaders take a conservative approach to DM, particularly when information is incomplete or conditions are unusual; managers take timely action to address degraded conditions; executives and senior managers reinforce the expectation that the reactor will be shut down when procedurally required, when the margin for safe operation has degraded unacceptably, or when the condition of the reactor is uncertain; individuals do not rationalize assumptions for the sake of completing a task; and the organization ensures that important nuclear safety decisions are made by the correct person at the lowest appropriate level. (pp. 19-20) That's quite a mouthful but it's not all of the behaviors and some of the included ones have been shortened to fit. On the positive side, the INPO treatment of DM is much more comprehensive than what we've seen in the NRC Common Language Path Forward materials released to date. But the DM example illustrates a major problem with this type of document: a lengthy laundry list of observable behaviors that can morph into de facto requirements. Now INPO says “. . . this document is not intended to be used as a checklist. It is encouraged that this document be considered for inclusion and use in self-assessments, root cause analyses, and training content, as appropriate.” (p. 3) But while the observable behaviors may be intended as representative or illustrative, in practice they are likely to become first expectations then requirements. An overall tone of absolutism reinforces this possibility. Another problem is the lack of priorities or relative importance. Are all the traits equally important? How about the attributes? And the observable behaviors? Is it up to, say, a team of QA assessors to determine what they need to include or do they only look at what the boss says or do they try to evaluate everything even remotely related to the scope of their inquiry? We could not say it better ourselves. 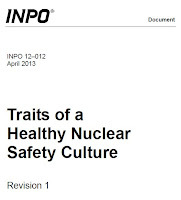 * Institute of Nuclear Power Operations (INPO), “Traits of a Healthy Nuclear Safety Culture” INPO 12-012, Rev. 1 (April 2013). The report has two addenda. One describes nuclear safety behaviors and actions that contribute to a healthy nuclear SC by organizational level and the other provides cross-references to other INPO documents, the NRC ROP cross-cutting area components and the IAEA SC characteristics. Thanks to Madalina Tronea for making these documents available. This section establishes the authors' view of error and how socio-technical systems function. They describe two mutually exclusive world views: (1) “erratic people degrade an otherwise safe system” vs. (2) “people create safety at all levels of the socio-technical system by learning and adapting . . .” (p. 6) It should be obvious that the authors favor option 2. “There is a loose coupling between process and outcome.” A “bad” process does not always produce bad outcomes and a “good” process does not always produce good outcomes. “Knowledge of outcome (hindsight) biases judgments about process.” More about that later. “The design of artifacts affects the potential for erroneous actions and paths towards disaster.” This is Human Factors 101 but problems still arise. “Increased coupling increases the cognitive demands on practitioners.” Increased coupling plus weak feedback can create a latent failure. This section covers traditional mental models used for assessing failures and points out the putative inadequacies of each. The sequence-of-events (or domino) model is familiar Newtonian causal analysis. Man-made disaster theory puts company culture and institutional design at the heart of the safety question. Vulnerability develops over time but is hidden by the organization’s belief that it has risk under control. A system or component is driven into failure. The latent failure (or Swiss cheese) model proposes that “disasters are characterized by a concatenation of several small failures and contributing events. . .” (p. 50) While a practitioner may be closest to an accident, the associated latent failures were created by system managers, designers, maintainers or regulators. All these models reinforce the search for human error (someone untrained, inattentive or a “bad apple) and the customary fixes (more training, procedure adherence and personal attention, or targeted discipline). They represent a failure to adopt systems thinking and concepts of dynamics, learning, adaptation and the notion that a system can produce accidents as a natural consequence of its normal functioning. An organization's sharp end is where practitioners apply their expertise in an effort to achieve the organization's goals. The blunt end is where support functions, from administration to engineering, work. The blunt end designs the system, the sharp end operates it. Practitioner performance is affected by cognitive activities in three areas: activation of knowledge, the flow of attention and interactions among multiple goals. The knowledge available to practitioners arrives as organized content. Challenges include: organization may be poor, the content may be incomplete or simply wrong. Practitioner mental models may be inaccurate or incomplete without the practitioners realizing it, i.e., they may be poorly calibrated. Knowledge may be inert, i.e., not accessed when it is needed. Oversimplifications (heuristics) may work in some situations but produce errors in others and limit the practitioner's ability to account for uncertainties or conflicts that arise in individual cases. The discussion of heuristics suggests Hollnagel, reviewed here. Goal conflict can arise from many sources including management policies, regulatory requirements, economic (cost) factors and risk of legal liability. Decision making must consider goals (which may be implicit), values, costs and risks—which may be uncertain. Normalization of deviance is a constant threat. Decision makers may be held responsible for achieving a goal but lack the authority to do so. The conflict between cost and safety may be subtle or unrecognized. “Safety is not a concrete entity and the argument that one should always choose the safest path misrepresents the dilemmas that confront the practitioner.” (p. 139) “[I]t is difficult for many organizations (particularly in regulated industries) to admit that goal conflicts and tradeoff decisions arise.” (p. 139) Overall, the authors present a good discussion of goal conflict. The design of computerized devices intended to help practitioners can instead lead to greater risks of errors and incidents. Specific causes of problems include clumsy automation, limited information visibility and mode errors. Automation is supposed to increase user effectiveness and efficiency. However, clumsy automation creates situations where the user loses track of what the computer is set up to do, what it's doing and what it will do next. If support systems are so flexible that users can't know all their possible configurations, they adopt simplifying strategies which may be inappropriate in some cases. Clumsy automation leads to more (instead of less) cognitive work, user attention is diverted to the machine instead of the task, increased potential for new kinds of errors and the need for new user knowledge and judgments. The machine effectively has its own model of the world, based on user inputs, data sensors and internal functioning, and passes that back to the user. Machines often hide a mass of data behind a narrow keyhole of visibility into the system. Successful design creates “a visible conceptual space meaningfully related to activities and constraints in a field of practice.” (p. 162) In addition, “Effective representations highlight 'operationally interesting' changes for sequences of behavior . . .” (p. 167) However, default displays typically do not make interesting events directly visible. Mode errors occurs when an operator initiates an action that would be appropriate if the machine were in mode A but, in fact, it's in mode B. (This may be a man-machine problem but it's not the machine's fault.) A machine can change modes based on situational and system factors in addition to operator input. Operators have to maintain mode awareness, not an easy task when viewing a small, cluttered display that may not highlight current mode or mode changes. To cope with bad design “practitioners adapt information technology provided for them to the immediate tasks at hand in a locally pragmatic way, . . .” (p. 191) They use system tailoring where they adapt the device, often by focusing on a feature set they consider useful and ignoring other machine capabilities. They use task tailoring where they adapt strategies to accommodate constraints imposed by the new technology. Both types of adaptation can lead to success or eventual failures. The authors suggest various countermeasures and design changes to address these problems. Different approaches for analyzing accidents lead to different perspectives on human error. Distancing through differencing is another risk. In this practice, reviewers focus on differences between the context surrounding an accident and their own circumstance. Blaming individuals reinforces belief that there are no lessons to be learned for other organizations. If human error is local and individual (as opposed to systemic) then sanctions, exhortations to follow the procedures and remedial training are sufficient fixes. There is a decent discussion of TMI here, where, in the authors' opinion, the initial sense of fundamental surprise and need for socio-technical fixes was soon replaced by a search for local, technologically-focused solutions. This is a book about organizational characteristics and socio-technical systems. Recommendations and advice are aimed at organizational policy makers and incident investigators. 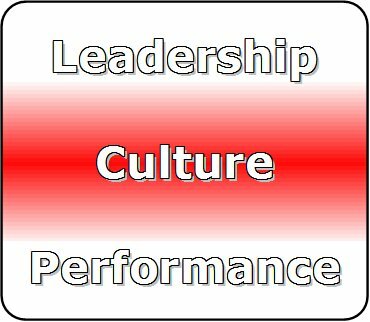 The discussion of a “just culture” is the only time culture is discussed in detail although safety culture is mentioned in passing in the HRO write-up. Our first problem with the book is repeatedly referring to medicine, aviation, aircraft carrier operations and nuclear power plants as complex systems. *** Although medicine is definitely complex and aviation (including air traffic control) possibly is, carrier operations and nuclear power plants are simply complicated. While carrier and nuclear personnel have to make some adaptations on the fly, they do not face sudden, disruptive changes in their technologies or operating environments and they are not exposed to cutthroat competition. Their operations are tightly coordinated but, where possible, by design more loosely coupled to facilitate recovery if operations start to go sour. In addition, calling nuclear power operations complex perpetuates the myth that nuclear is “unique and special” and thus merits some special place in the pantheon of industry. It isn't and it doesn't. 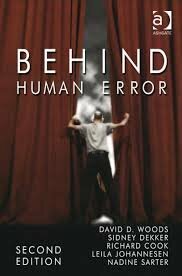 Our second problem relates to the authors' recasting of the nature of human error. We decry the rush to judgment after negative events, particularly a search limited to identifying culpable humans. The search for bad apples or outright criminals satisfies society's perceived need to bring someone to justice and the corporate system's desire to appear to fix things through management exhortations and training without really admitting systemic problems or changing anything substantive, e.g., the management incentive plan. The authors' plea for more systemic analysis is thus welcome. But they push the pendulum too far in the opposite direction. They appear to advocate replacing all human errors (except for gross negligence, willful violations or sabotage) with systemic explanations, aka rationalizations. What is never mentioned is that medical errors lead to tens of thousands of preventable deaths per year. **** In contrast, U.S. commercial aviation has not experienced over a hundred fatalities (excluding 9/11) since 1996; carriers and nuclear power plants experience accidents, but there are few fatalities. At worst, this book is a denial that real human errors (including bad decisions, slip ups, impairments, coverups) occur and a rationalization of medical mistakes caused by arrogance, incompetence, class structure and lack of accountability. This is a dense book, 250 pages of small print, with an index that is nearly useless. Pressures (most likely cost and schedule) have apparently pushed publishing to the system boundary for copy editing—there are extra, missing and wrong words throughout the text. This 2010 second edition updates the original 1994 monograph. Many of the original ideas have been fleshed out elsewhere by the authors (primarily Dekker) and others. Some references, e.g., Hollnagel, Perrow and the HRO school, should be read in their original form. * D.D. Woods, S. Dekker, R. Cook, L. Johannesen and N. Sarter, Behind Human Error, 2d ed. (Ashgate, Burlington, VT: 2010). Thanks to Bill Mullins for bringing this book to our attention. ** There is considerable overlap of the perspectives of the authors and the control theorists (Leveson and Rasmussen are cited in the book). As an aside, Dekker was a dissertation advisor for one of Leveson's MIT students. *** The authors' different backgrounds contribute to this mash-up. Cook is a physician, Dekker is a pilot and some of Woods' cited publications refer to nuclear power (and aviation). **** M. Makary, “How to Stop Hospitals From Killing Us,” Wall Street Journal online (Sept. 21, 2012). Retrieved July 4, 2013.